Back when I lived in Minneapolis I had the pleasure of dealing with a media representative for the legendary magazine The New Yorker. I acquired a taste for it when I was just starting in the ad game in New York. Once, over lunch, he told me the story of how a little company in Medford, Oregon began selling fruit by mail. It seems a New Yorker Salesman had decided to drive to Portland and Seattle from San Francisco and he was making stops along the way to pitch his magazine. In those days it was beginning to develop the peculiar circulation it has to this day. Most of the print run goes to New York but it is also read by a solid coterie of subscribers in major cities and high income demographic towns across the country. That little company in Medford was Harry & David. They decided to test a small space ad in the publication. They sold out their apple crop. Then pears. And the cherries. That was the beginning for them. They became a legend by selling fruit via direct ads and mail across the USA. A few years ago my then wife and I went to the Shakespeare Festival in Ashland (just north of Medford in southern Oregon). We stayed at a delightful B&B. The first evening over wine, cheese and pears that were to die for we learned our host was also the marketing director of Harry & David. We talked of how that first ad had changed the lives of the partners but more importantly hundreds of people in the Rogue valley. He stressed the fact that the values that were in place for that first ad remained and would continue into the future. Now I find myself living as my friends say, “where the sidewalk runs out” south of Portland. I’ve been a Harry & David Customer for more years then I care to count. I know a conglomerate bought them out a while back but the buyers haven’t messed with what makes the company outstanding. This year I had to change my order. Mom asked me to. She said she couldn’t handle all that they sent in the Fruit of the Month club since Dad died. So I made the call. I found myself talking to Margaret who understood completely. She walked me through some options. Then we settled on regular fruit shipments but in smaller quantities. She quietly checked all the pertinent shipping data and then helped me with the rest of my list. People that want to help on the phone. NO pushy sales types. NO hard sells. Catalogs in the mail because I’ve told them I prefer not to get an e-mail every day for a month after Thanksgiving. No questions asked returns or changes if needed. Dad couldn’t eat grapefruit due to a medication conflict. Mom called them and a substitution was made even though it was requested well before needed. People you come to know, like and trust. It takes time, vision, values, consistency, honesty and real caring. That builds trust and the outcome is a legendary brand. Jerry Fletcher is the founder and Grand Poobah of www.BrandBrainTrust.com His consulting practice, now in its 26th year, is known for Brand Development, Positioning and business development on and off-line. “Any of y’all have somebody contact you several years after you pitched ‘em and they turned you down?” asked Bubba, Georgia’s answer to branding’s high court. Rob, even though we call him Bubba is sharp. When he asks a question like that in this group you know there’s something he is really curious about. It takes time to get to trust. Prospect knowledge in your area of expertise leads to trust. So how did he come to pick you?” asked Kate. Prospects need time to understand why they should trust you. “You’re right my direct marketing friend,” I responded. “That assumption is at the heart of so many expectations that people have of their marketing that are so wrong! Brand is something you have to allow to happen instead of trying to control it. That’s why it is nearly impossible to put a number on it. Rob, who all of us call Bubba turned on his Georgia charm and said, “You betcha. Research folks believe you can figure out how powerful a brand y’all have by showing people your logo along with the competitions. Tha’s why lots of folks think a logo is a brand. Taint. Awareness—that’s the percentage of folks asked that can identify your “brand” and what it is all about from nothin’ more than your logotype. Preference—what share of the folks that can identify you and your competitors say they pick you first in a buying situation. Acquisition—that’s when it gets harder ‘cause you’re dealin’ with actual sales versus the competition but if you keep good records even ‘little guys’ can use this measure. Satisfaction comes next. Most marketer don’t want to admit that not everyone likes their product or service even when they buy and use it. Repeat— Another way to figure out where you really stand is lots easier in today’s on-line purchase world if you’re price, delivery included, is still the best easily available. 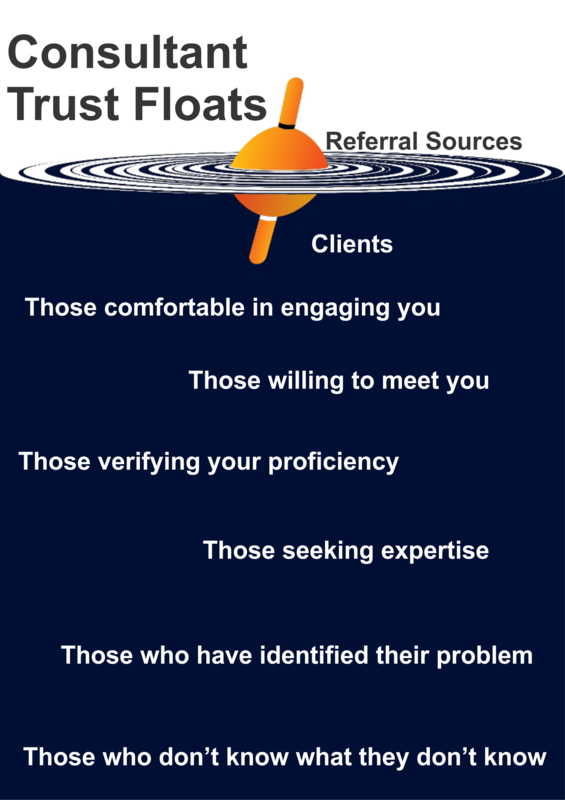 Referral—is the final measure in reality. Y’all can get an idea about this by asking everyone that considers your product or service who told them about you. “Don’t forget,” Bubba said, just about nobody ever gets 100% awareness. Best ever I saw was barely north of 90%. You can measure brand but generally only when it becomes a regional or nationally known product or service. A high awareness score is terrific but Preference, Acquisition (sales), Satisfaction, Repeat and Referral are always lower than Awareness. Always. Better understanding of the customer life cycle creates better customer engagement. Marketing’s ability to probe customer concerns and interests via projections of big data analysis on individual accounts give sales deeper insights into how to more quickly build targeted trust-based relationships. “Only for a few companies at the enterprise level,” I said. “But as you well know from your own consulting business the divide between marketing and sales is, most of the time, not a big one. It is kind of hard for it to be when it is the same person. The only time it comes up is when a consultancy starts to grow and they add a sales person to the staff. A consultant connects with a prospect, builds trust, reaches agreement, provides the service and maintains the relationship. There is no disconnect. Engagement flows freely from marketing activity into sales, delivery and, in the best operations, into a long term relationship. Engagement is the key word. I believe mid-level companies can profit by building a closer relationship between marketing and sales particularly in the development of sales support materials that build trust and demonstrate real understanding of customer problems. Technology is paving the way for big companies to gather and analyze data to bridge the divide between marketing and sales. Consultants already routinely do this. Mid-level companies can move toward this new level of integration by giving sales people a starring role in helping develop communications that nurture the sale. I arrived a little late and found our branding Guru in the middle of one of his southern fried soliloquys. “We were talkin’ about that story you told last week about the company trying to get to a sustainable level of business and I allowed as how you don’t always have to go whole hog. It’s like my buddy Charlie’s approach to romance. “Okay y’all, the point is he calls that Huggin’ and Chalkin’. It’s the same when you’re tryin’ to build a company on limited funds. You go as far as you can to build trusted relationships with the time and money you have making sure that anyone that becomes a customer knows you really care about them. Building a business with limited resources can be done. You can reduce your acquisition actions but never eliminate them. Keep contacting your current customers regularly in order to retain them. “All I did was take her idea and run with it,” I protested. “I told her to think about the kind of houses that get staged. They are what I call McMansions. They start north of $400,000. Around here most of them have fireplaces. The one place in a house like that which a painting of size will get noticed is above the fireplace. The painting must be big enough to hang there and command the space. It has to be an original. That’s the only way to get a good price. Big. Original. Commanding. Expensive. “Yes, madam sales master,” I replied. “More importantly she had pretty good sales records of the three major styles she was working in. One approach was selling three times better than the others. Visually it was less complex than either of the others but still gave her a great deal of latitude in which to work. She will build an inventory in that series before moving on to the more complex canvases because she will be able to sell them more quickly. Jerry Fletcher’s blog recaps conversations with clients, prospects and the unruly mob of business development professionals he consorts with. They discuss marketing that works from solopreneur to enterprise level. Jerry Fletcher is the ringleader and “Watson” of the dialogue. “Yes, I have something up my sleeve” I said. The others sat stunned because I’d shown up in a suit. “I wrote about this not long ago and I’m continuing to research it. The speech was called The Shortcut to Trust. (See part of it here) What it comes down to is that there is an interesting shift going on in marketing. It may be generational but that is what makes what I’m finding so much more powerful. Younger people seem to not like direct contact, sometimes even from a friend. I’ve watched them make every argument you can imagine to avoid having to respond to a phone call. They literally will send an e-mail to someone that sits 5 feet away. Worse still, they text and don’t check their e-mail. But entrepreneurs quickly learn that people don’t do business with you until they trust you. First they have to get to know you and then like you. With that younger customer and that younger employee you need what I call AutoMagic Marketing. Digital Marketing integrated with Contact Management is AutoMagic Marketing, the first step on a shortcut to Trust. Add a personal touch and your sales will increase Auto Magically! “It all comes down to your form, “I said. “Are we talking golf or Tennis? “ Chris asked as he sat down. Use radio buttons where applicable to allow for faster viewer scanning. “If I bring my client to lunch will you guys repeat yourselves?” I asked. Forms on web sites, landing pages and sales sites are all better when they are built with a personal touch in mind– like an invitation. That means designing the form to fit in seamlessly while making it as easy for the user as possible. “What did you tell her?” said Gail. Somewhere north of 75% of all callers that get an answering machine hang up. Nine out of ten customers that get a machine in business hours think you are too small to do business with. About two thirds of people will immediately call a competitor if a human doesn’t answer. “Yes,” I said. “the fact is that if you operate like Kate and a number of consultants I’ve worked with, you will have people calling in anywhere up to three hours ahead or behind the local time zone you operate in because you work with clients or prospects across the USA. In addition, if you are connected on multiple continents you need to worry about what day it is as well as what time. Over 85% of the times someone might call are outside the time a receptionist is in the office! The beauty of an answering service, a good one, is that you can get coverage 24 hours a day, 7 days a week. On top of that, if you need to gather data for a form or other information a good service can handle it. There are even services that can set telephone appointments for you when someone calls in. 80% of callers that get a machine will not call back (and that percentage is increasing). 73% of callers answered by a human will not call a competitor (but you have less than two minutes to have someone knowledgeable on the line to handle their questions or arrange for someone to call them back). A study from the UK indicated that a human answering every call could increase sales by 25%.